President Trump and his administration have a unique chance to convince Russian leader Vladimir Putin to give up power and return the country to the path of democratic political reform, a leading Russian opposition leader says. 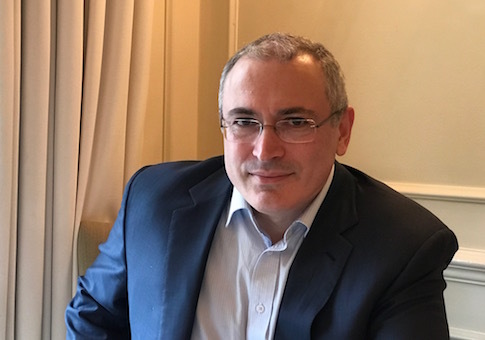 Mikhail Khodorkovsky, the exiled Russian businessman turned democracy advocate, also warned that Russia under Putin has grown increasingly unstable, and that the nuclear-armed state could collapse in the future. "The only opportunity to seriously change things in the relations between Putin and America under today's [Trump] administration would be to convince Putin that it is in his best interest to leave power while this administration is in power. Then all the other problems can and will be solved," Khodorkovsky said in an interview at a Washington hotel. Speaking through an interpreter, Khodorkovsky, who is viewed as a future leader of Russia, dismissed the anti-Russia hysteria currently sweeping Washington as the result of a lack of understanding about what's going on in Russia. Putin enjoys seeing American leaders and news media portray him as an all-powerful figure capable of swaying the U.S. presidential election against Democratic nominee Hillary Clinton and in favor of Trump, something Khodorkovsky said is "laughable." "If Putin had any objectives whatsoever vis-à-vis that election, it was that when Clinton won—and everybody in the Kremlin was convinced Clinton would win—to create a couple of nice visible incidents in the U.S. featuring Trump's losing supporters accusing Clinton of dishonest elections in order to then show this [news] footage in Russia in order to subsequently allow himself to falsify his own elections to say, ‘Look everybody does it,'" he said. Trump's victory was a huge surprise for the Kremlin, and asserting Putin had a major role in influencing the outcome is not accurate, he added. Khodorkovsky instead said, "Your FBI director probably had more impact on the election than Putin," a reference to FBI Director James Comey's high-profile disclosure of a renewed probe of Clinton's unsecured email server days before the November vote. As for charges that Trump campaign aides were investigated for ties to Russian intelligence, Khodorkovsky said the allegations likely are the result of participation in the campaign by those outside the mainstream of American politics. "I hope you'll agree that to some extent, Trump is president of the alt-elite, not the mainstream elite," he said. "And so therefore the people he brought in to his campaign staff, these people are quite possibly less prudent than members of the mainstream elite might be. And so I would not be surprised that they may have taken some incautious steps." Putin has targeted alternative elites around the world in influence operations. "He tries to be generous to them, to build relations with them," Khodorkovsky said. The opposition leader said he does not know whether Putin succeeded in cultivating outside political figures, although that has been one of his objectives throughout Europe, including within key powers France and Germany. "So it would be strange if he were doing something differently here, and it would be strange if nobody here got caught on that hook," he said, adding that he does not know if any of these people ended up in Trump's inner circle. The former oil company executive was imprisoned in Russia in 2003 on fraud charges widely seen as political retribution. Putin pardoned him in 2013 as a humanitarian gesture prior to the Sochi Olympic Games. Khodorkovsky now resides in London and supports a think tank, Open Russia, that is working for democratic reform. Khodorkovsky said he believes democratic change can be brought to Russia within the next few years. "I would say that within the next six to 10 years, the situation within Russia will change dramatically," he said. "For me that's not a long time because these are fundamental changes we're talking about." The reaction against democracy since 2003 will end in the coming years and the Trump administration could accelerate the change, he continued. "I feel that this American administration has the ability to make sure this is six years and not 10," he said. The Russian opposition leader said he would be meeting with congressional leaders to discuss the situation in Russia and hopes for meetings at the White House, including with Trump. What would he tell the new president? "I would tell him that the current American administration has created a crisis of sorts in the heads of America and the whole world, really," he said. "But we know that a crisis is not only a time of danger but a time of opportunity. I feel that Trump and his administration have an opportunity in the Russia area to not merely continue the successful or unsuccessful directions that previous administrations have followed, but to actually come to some solutions that were not possible before the Trump administration and will possibly be not possible after the Trump administration. It's a window of opportunity." Trump is expected to seek a reset in relations with Moscow. Discussions are likely to include Russia's military intervention in Syria and its partial takeover and continuing subversion of Ukraine. Nuclear disarmament also is a likely area of discussion. Khodorkovsky said any reset is unlikely to produce better relations. "Putin will no doubt drive a hard-nosed bargain on all of these points, but there won't be any serious resolutions of them because you are absolutely correct: For Putin, America as an enemy is something that is very convenient for him, very useful in order to retain his own power in Russia," Khodorkovsky said. Putin initially reacted cautiously to Trump's election. Recent Russian-controlled media reports have taken a harder line on the new president. Khodorkovsky said the unique opportunity for the Trump administration is that, for the first time in the last 20 years and likely for the next 10 or 20 years, the new president is willing to reconsider the post-World War II international order reached in Yalta in 1945 that is the basis for the current geopolitical landscape. "I'm not saying that that's a good thing or bad thing," he said. "I'm saying that this administration is prepared to reconsider the Yalta world order. So if Putin leaves during this administration, he will be able to negotiate with this administration some of his personal achievements in foreign policy. It's unlikely that he'll be able to negotiate about those with the next administration whatever that may be." Putin likely will seek to create new problems for the United States around the world and use them as bargaining chips in relations with the United States. Part of the Russian leader's strategy is to create a security buffer zone around his country. "The problem is that by staying in the same place he is in, [Putin] is destroying Russia from within," Khodorkovsky said. For instance, parts of the Russia Federation, such as Chechnya, are not under Moscow's control and Chechen authorities have been conducting political assassinations in Moscow. The 2015 assassination of pro-democracy opposition leader Boris Nemtsov—who was killed several hundred yards from Putin's Kremlin office—is another troubling sign of instability. "You can understand that this does not create stability in the country, it starts rocking the country," Khodorkovsky said. "So Putin's staying where he is is not creating long term stability." A pro-democracy activist associated with Open Russia recently fell ill a second time in two years from an apparent poisoning. Vladimir Kara-Murza, a journalist who promoted a documentary film about Nemtsov, nearly died after the incident, which appeared to be designed to intimidate other Russian pro-democracy activists. Khodorkovsky said he is not optimistic that a U.S. information operation to expose Putin would result in his departure from power. Most Russians already suspect that Putin's massive personal wealth—by some estimates amounting to $45 billion—was obtained by siphoning off funds from the oil company Surgutneftegaz. However, he said, a "hybrid tactic" to convince Putin to either step down or initiate democratic reforms could work. "The days are long gone when you could sit at the negotiating table and slam your fist on the table and say, ‘either you go or we make you go,'" Khodorkovsky said. "I think it is to the advantage of both Russian society and American society for Putin to leave. But the world is such that in order for this to happen it needs to be done so that it's in Putin's advantage to leave," he said. Khodorkovsky said Russia started down the path to democracy in 1985, a path that ultimately produced the collapse of the Soviet Union in 1991. However, in 1993 the constitution was changed to give the president unchecked power. Russian political leaders in the early 1990s had the support of good officials, scientists, and industrial leaders, but lacked communicators who could explain the reforms being taken. "What we didn't have were people able to properly communicate between the government that was instituting the reforms and the people who needed to accept the reforms," he said. "Which is why the word democracy in Russia became a swear word." Khodorkovsky wants to see a return to a political system of checks and balances between the executive, legislative, and judicial branches, as well as a free press to replace Russia's government-controlled media. "It would be best if these problems were to be solved in a soft way, in a planned, orderly way and better yet with Putin's participation," he said. "Then there won't be any unpleasantness in the process. We feel that this could be done with the involvement of the current American administration and we feel that it would be to America's advantage as well because then Russia could finally focus on solving its own problems rather than focusing on what kind of new problems to create for America." Through Open Russia, proposals are being made for democratic reforms and young people are being trained as democracy communicators and sent abroad to learn about free elections. "We're ready to take part in this work, or, in the event that power collapses, we're ready to take on this work and do it ourselves," he said. "But option two is not our preferred option because we want to see reform, not revolution in Russia. But we have to be prepared for that option as well and we are." American perceptions of Russia today vary widely. There are those who say Putin is the most important world leader, and others who say Russia is on the verge of collapse. Both views are inaccurate, Khodorkovsky said. "People here tend to believe that in order to maintain the status quo, we've got to preserve Putin," Khodorkovsky said. "Actually, the situation is different. If we want Russia to exist and to exist as a normal country, then Putin has to leave, in, historically speaking, a rather short period of time."